When it comes to the big game, we are downright devoted to dips. This keto-friendly recipe is a great appetizer to serve at any event; it’s the ultimate low-carb comfort food. 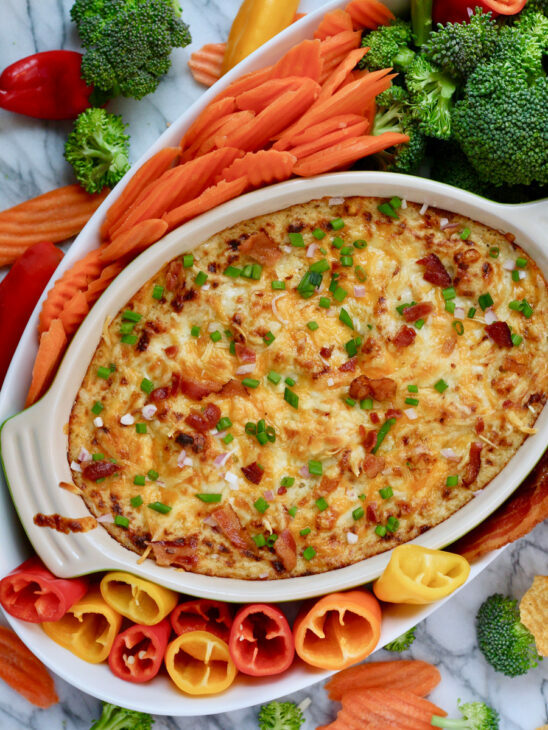 Cauliflower-Bacon Dip is the perfect game day recipe. The mouthwatering blend of roasted cauliflower, smooth cheese, salty bacon and creamy sour cream is absolutely addicting. Need we say more? This keto recipe is incredibly easy to make: just throw everything in your food processor and then dump the mix into a baking dish. Honestly, that’s it. Not only is this cheesy bowl of goodness keto-approved, but it takes your appetizer spread to the next level of awesome. In addition to fresh veggies, go ahead and throw some chips on the side for your carb-loving friends. They’ll never know that the base recipe is keto, it seriously tastes that amazing. In a large bowl, toss cauliflower florets with olive oil, salt and pepper together and then pour evenly onto a large baking sheet. Roast until golden, turning halfway through, for about 25 minutes. Allow roasted cauliflower to cool to room temperature (Optional: Using a clean dish towel, squeeze any excess water out of the cauliflower. This will give you a thicker dip). 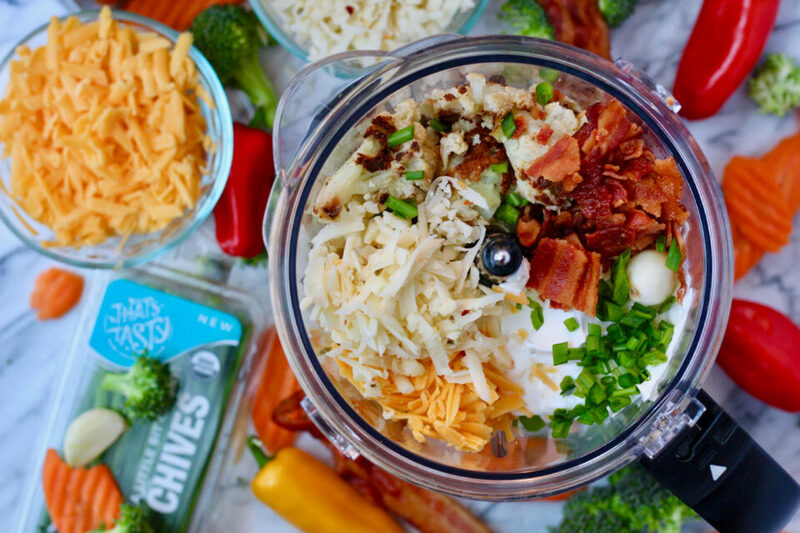 Transfer cauliflower to your food processor and pulse together with the garlic, sour cream, 2 cups grated cheese, crumbled bacon and ¼ cup chopped chives. Transfer mixture to a baking dish and sprinkle with additional cheese. Bake for 20 – 25 minutes, or until the cheese is starting to brown and the inside is warmed. Serve with your desired dipping companions and enjoy immediately. We love mixing up the blends of cheese in this recipe. Like your appetizers with a bit of a kick? Use one cup of cheddar alongside one cup of pepper jack. Add a few shakes of your favorite hot sauce for extra zing. Serve with smashed avocado that’s topped with chives, salty bacon, and a squeeze of fresh lime juice. Swoon. Can you make cauliflower-bacon dip in a slow cooker? Absolutely! Simply follow directions through step 4. Then, spray the inside of your slow cooker with cooking spray and pour in the mixture, making sure to spread it evenly. Cover and cook on high for 1.5 hours (or on low for roughly 3 hours). Garnish and serve straight from the slow cooker or transfer to a serving dish.